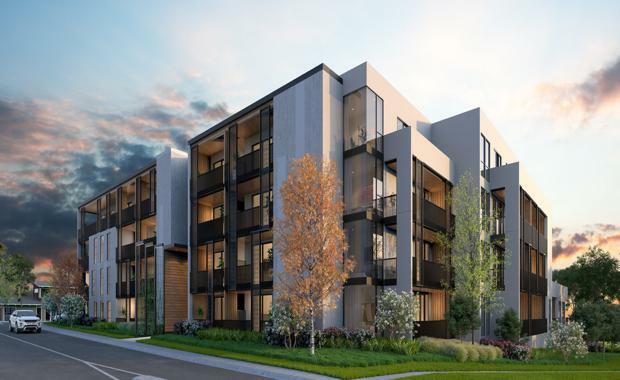 Dubbed a popular eastern suburb in an up-and-coming residential location for apartment dwellers, Victoria's Doncaster East is welcoming Prominence, an apartment project which takes no issue in considering itself ‘superior in every way’. The development is located about 18 kilometres from Melbourne's CBD and provides 66 apartments that offer a balance of two worlds - access to the open spaces along the Yarra River, together with high-end shopping facilities and transport options. Development company One World Group describes Prominence as ambitious and bold as a project, ready to deliver elegance and sophistication to even the most discerning purchaser in East Doncaster. Prominence provides sprawling green spaces while being adjacent to the local schools, shopping, dining and leisure facilities, as well as the public transport and private vehicle access into the Melbourne CBD. The development provides an appealing mix of one, two, three and four bedroom apartments that are designed to promote the best of modern living. Designed by CHT Architects, each apartment comes with ample storage, natural finishes of timber, ceramics and stone, generous living spaces and oversized balconies, courtyards and terraces that offer plenty of private outdoor space to play and entertain. All residences have been thoughtfully arranged to make the most of location and maximise privacy, according to One World Group. Aside from the personal living spaces, Prominence also provides a communal courtyard that is 500 square metres of recreational spaces to relax and unwind with friends and family. Prominence apartments are set to offer affordable luxury for the downsizer, challenging the area’s median house price of $1,100,000. Once World Group are confident that investors will appreciate the record low vacancy rate of 1.8% which is below the state average as well as the 8.4% annual rental unit price growth which ensures steady and healthy yield.